Mine Shaft and Arid Point: just another dive, monotonous. Mid-southern quarter of the Poor Knights Islands. The sand garden is quite a prominent but invisible feature of the Poor Knights. Storm waves mop deep sand from Bartle's Bay to the shallows and then currents carry it through Urupa Passage into the Sand Garden as Westerly chop mops it gently back. As a result there exists a shallow sand garden that gently slopes down westward to 35m depth where a rocky wall descends further down. 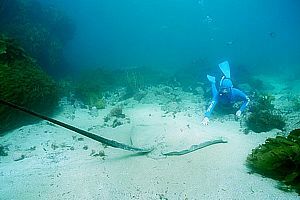 This sand garden runs at 18m depth at the entrance to Nursery Cove where it ascends to a mere 3m depth, the shallowest sand found at the Knights. Thus the sandy habitat is rather small and therefore interesting. 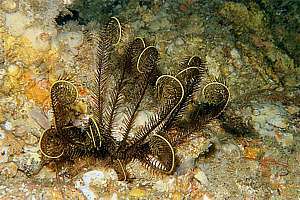 On it one finds comb stars burrowed under, hat urchins sliding over the sand, diadema urchins coming out by night from nearby caves, lizard fish hunting, goatfish foraging, sting rays and many other interesting creatures, and even garden eels have been seen. One of the little noticed miracles are golfball-sized round balls on top of the sand, called rhodoliths (red stones). 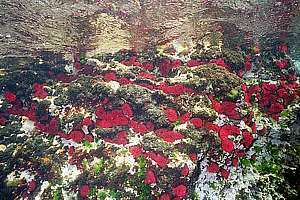 These are made by pink paint calcareous algae (Lithothamnion sp.) around a little stone or shell fragment. As each leaf grows over the existing ones, the rhodolith is rolled and turned by waves, eventually becoming a little golfball. 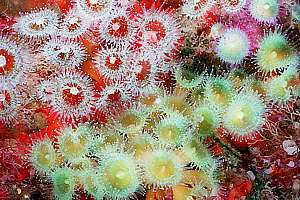 Inside it are cavities, inhabited by a tiny microcosm of bristle worms, crustaceans and other creatures. Because of the cavities, rhodoliths are very light and easily moved by waves and currents. 0701085: view over the sand gardens towards Urupa Passage in the middle and Nursery Cove to the right. A few red billed gulls bob on the water, waiting for surface-feeding schools of fish to re-appear. 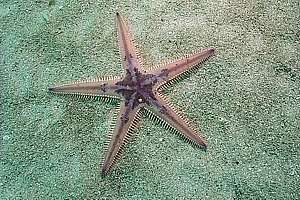 f048810: the comb star (Astropecten polyacanthus) lives almost its entire life burrowed under the sand where it can sometimes be inferred from a slight five-armed depression. Finding one means that many are around. f025326: goatfish (Upeneichthys lineatus) of various age vying for the attention of a rare comb fish (Coris picta) . 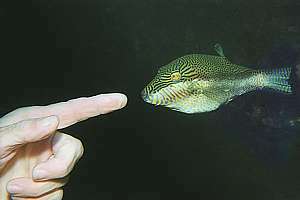 By changing colour and with clear body language the fish direct the cleanerfish' attention to where it is needed most. 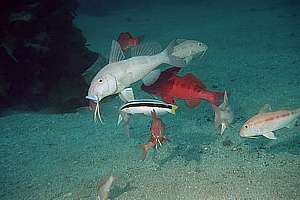 Among goatfish exists a clear pecking order, also for cleaning priority. It is the turn of the white one now. f029625: a tiny female sharp-nosed pufferfish (Canthigaster callisterna) or clown toado comes to inspect an outstretched finger. These little fish can puff themselves up to little round balls with a sharp nose on one end and a short tail on the other. They are so cute. f025032: lizardfish appear in most summers at divable depths of 15m and deeper, where they blend in perfectly with either sand or rock. These fish are cunning and swift predators on anything that moves. 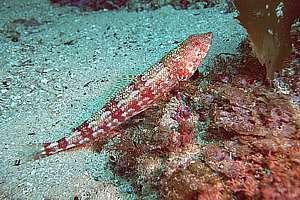 Two varieties can be encountered: the red lizard fish (Synodus doaki) and the lavender lizardfish (Synodus similis) which is smaller and has a light-blue stripe running along its back fin. 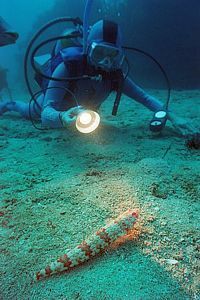 f023911: a diver points a torch at a red lizardfish. Nursery Cove is a unique place where old inhabitants live in an ever changing environment. This is the only place at the Knights where the sandy bottom almost reaches the surface as in a beach. At its shallow end one finds boulders that protect young fish from predation. At its deepest end it joins the Sand Gardens. In between stretches a gradually sloping rocky bottom with a river of sand on its northern side. 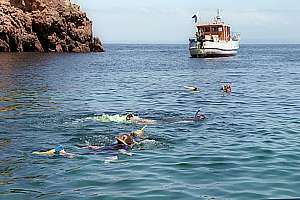 Nursery Cove is an outstanding place for snorkelling, particularly for those capable of diving down and staying down for a while. To master the techniques of snorkelling, read snorkelling without fear . f219421: the classical MV Wairangi runs ecological trips to the Poor Knights, often for school groups. 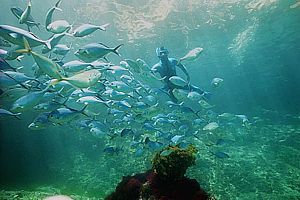 Here a bunch of youngsters is snorkelling Nursery Cove. f219522: when offered a crust of bread, fish come to the surface. 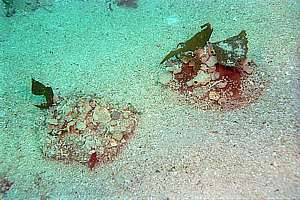 Here a Sandager's wrasse takes a bite. f041519: young 2-year old blue maomao are sheltering in the spaces between big boulders, where the water is rough at the shallow end of Nursery Cove. f041136: a young bluefish (Girella cyanea) frequents the shallows to invite schools of young fish to pick at its sea lice. f041130: a mating aggregation of kelpfish (Chironemus marmoratus) under a boulder in wild water. When sexually excited, these fish become very dark with bright white spots. f029515: where shade dominates, one can find these fiery red beadlet anemones or horse anemones (Isactinia tenebrosa) at mid tide level. Choose a high tide to see them open and catching zoo plankton. f041526: snorkeldivers who go down, witness the enormous variation in habitat and fish sheltering everywhere. f009809: demoiselles sheltering in craggy featherweed. In shallow water their main predator is the pied shag, an excellent diver and hungry predator. f023314: 3-4 year old blue maomao resting over strap kelp. It doesn't take long for these fish to become used to people in the water. 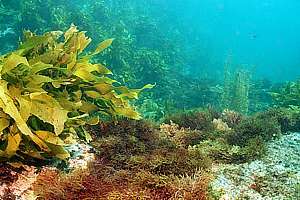 f048222: this habitat shot shows the pleasant variety in seaweeds of Nursery Cove: stalked kelp, strap weed, various red seaweeds and tall featherweed , and in the background the kelp forest. f012734: healthy stalked kelp and red fretsaw weed marking the boundary of a black angelfish' territory but do not make up its food. Black angelfish guard their weed gardens that they trim meticulously. f023317: a snorkeldiver following a mixed school of blue maomao and trevally. f028818: a tranquil scene in the shallows of Nursery Cove, where five large bluefish are seeking the help of schools of young koheru, to be cleaned from parasites. 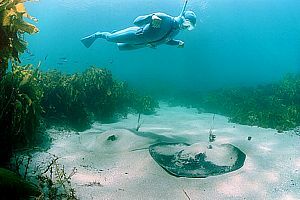 One of the attractions of Nursery Cove is that it is a favourite place for long-tailed stingrays (Dasyatis thetidis) that make little effort of burrowing in the sand. So they are easy to see. It is not uncommon to find 3-11 large stingrays there, and at times short-tailed stingrays and eagle rays as well. Nursery Cove allows them to find protection, sand and warmth. For them shallow, sheltered sand is a precious coincidence. f023317: two long-tailed stingrays (Dasyatis thetidis) lying side by side in the sand gutter of Nursery Cove. f029212: a snorkeldiver gently approaches a long-tailed stingray. 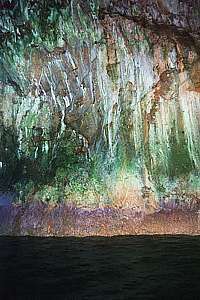 The Labyrinth is an underwater ridge descending from the surface down to the sand at 25m, riddled with cracks and tears, most of which are too narrow to enter. Particularly for this reason, it is a perfect place for fish to bed down for the night. The main item of interest is an archway through which divers can pass one at a time. This archway is a challenge for snorkeldivers as it can be snorkelled through. Best is to begin from its southern end, where the archway remains fully hidden from view. A few dips down shows you where it is. Now a few good breaths and down you go, all the way through the narrow arch, and up again at the other end. For experienced snorkellers a breeze, but for the median an exciting achievement. 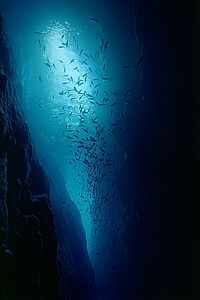 Because it is a safe place to dive, the Labyrinth offers an excellent night dive with high biodiversity. f034827: bigeyes (Pempheris adspersa) hang in the middle of the archway, visible on left. 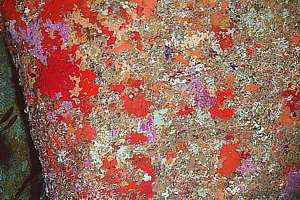 The walls are clad in sponges, bryozoans and purple gorgonian fans. f029623: feather stars (Crinoids) are also found in the archway of the Labyrinth. 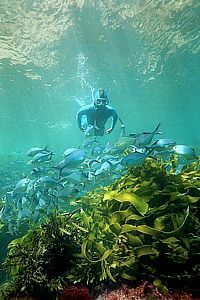 Anthoni, J F (1998) Snorkelling without fear: an essential freediving course to become confident in the sea. Charter boats prefer to spend lunch time in the gardens because of the shelter it provides, while the high rock walls re-radiate the warmth of the sun. 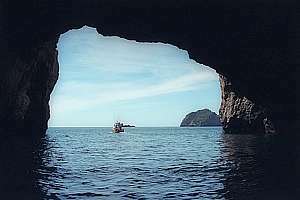 While decompressing, divers spend time to snorkel around, visiting El Torito Cave (named after a boat, owned by the American diver and explorer Walter Starck who lived for many years in Australia), Shag Rock and the submerged Trev's Rock. 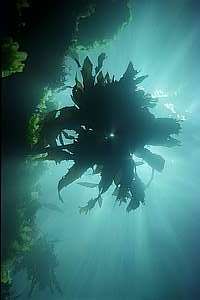 This is mainly a shallow kelp forest, bounded by a wall at 20m depth. But the bottom is full of boulders and places for organisms to hide. For boaties, please remember that two rocks make this place tricky: Shag Rock when submerged at high tide, and Trev's Rock when almost exposed at low tide. Please note that these are the remnants of a ridge that ran from El Torito cave outward. 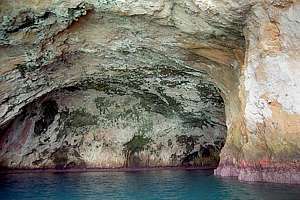 El Torito Cave and surrounds provide for excellent night diving, during which the cave itself may bring some disorientation if you don't use a compass. f030504: Charter boats anchored over the Gardens, close to the tall vertical cliff face, while divers snorkel nearby. In the foreground Shag Rock which is submerged at high tide. El Torito cave is found in the dark recess on left. 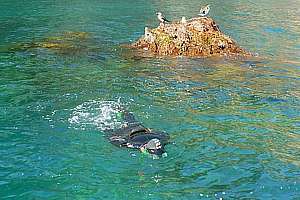 f030502: a snorkeldiver by Shag Rock which has two pied shags and two red-billed gulls on it. 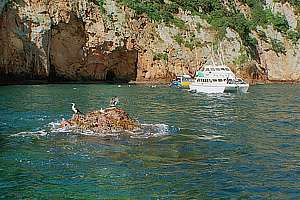 Boats usually anchor on the shallow side of Trev's Rock (35º28.83S 174º44.21E) over 10m depth. 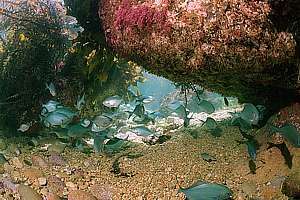 Trev's Rock (named after Trev Zenovitch, a champion diver) is rather pitted, providing refuge to a high variety of species. It is an excellent place to observe wrasses (labrids) and triplefins. On its deep end, Trev's Rock joins a wall beginning at 20m depth and reaching the sand at 30m. So one can have a shallow and a deep dive there. 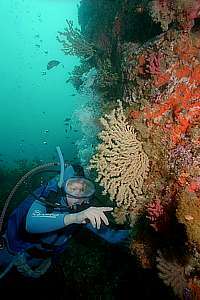 It is also an excellent spot for a safe night dive, and even a deep night dive. Note! Trev's Rock is a boating hazard and must be approached with care, particularly at low spring tide. Anchoring is good at its at its shallow eastern side, on rocky bottom. On its western side, one can anchor on 30m deep sand. f012815: sea lettuce growing just out of reach of the grazing sea urchins in wave-washed water that could knock the urchins off the rock, sending them to the deep. f022410: a male Sandager's wrasse peeping through one of the holes in Trev's Rock. These wrasses play hide-and-seek with divers. f012813: cathedral light around a stalked kelp, facing directly into the sun. Such photos can be taken only at steep cliffs in shallow water. 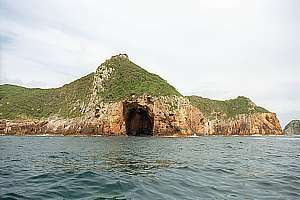 Rikoriko Cave is the flagship of the Poor Knights, reputedly the largest sea cave in the world, and impressive it is. Its dome is so large that a speed boat can do a circle in it at full speed. Yachts with their masts so tall, can enter, turn and leave safely. Most remarkable is that the ceiling of this dome does not show signs of erosion, like stone blocks having fallen out of its roof. The large bricks at its bottom must therefore have come from the outside in. 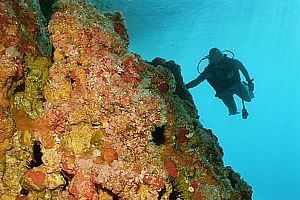 For divers, Rikoriko offers a number of exciting exploratory dives. But first note that it is an area visited by boats, so it would be unwise to surface in mid water. Always find your way to the surface along a cliff face. A shallow dive, 'doing the rounds' from one side, through the cave and out the other side. It is an interesting dive in which you can witness how the marine environment changes due to lack of light, and along this gradient, you will find a gratifying variety of life. You will need a good torch. A deep dive going from the entrance down toward the disappearing sands to depths of 35-40m. 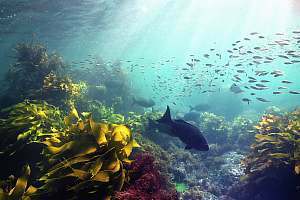 You will see how a sheltered marine environment changes with depth. 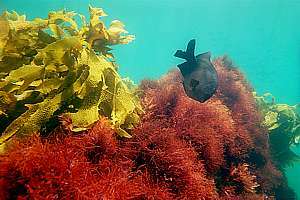 There are tall flexible weeds, kelp forests, gorgoneans, sponges and a good variety of fish with as ultimate prize, meeting a longfinned boarfish. A descending dive along the western side. Here you will see a grotesquely pitted rock face that plays havoc with the rules of habitat zoning. One finds seaweeds and urchins of all kind, close together and apparently oblivious to one another. At the top you'll find the robust wire weed (Carpophyllum angustifolium), the toughest bladderweed in NZ, zoned by flapjack (C. maschalocarpum) beneath, and the kelp forest (Ecklonia radiata) interlaced with flexible weeds (C. flexuosum). In the shallows the common green urchin (Evechinus chloroticus) prevails, but its zone merges with that of the purple urchin (Centrostephanus rodgersi), while here and there the white spined urchin (Tripneustes gratilla) climbs into the vegetation. Also the brown urchin () can be found. On the sands at 30-35m, you can find the diadema needle urchin (Diadema palmeri) hiding in caves on the sand. On the rock wall you will also meet the serpent stars (Ophidiaster kermadescensis, O. macknighti) and the puffy firebrick star (Asterodiscides truncatus). You guessed it - a perfect echinoderm dive. f009735: Rikoriko Cave seen from the outside in during a cloudy day, the diffuse light of which brings light to the rear. f012103: The almost perfectly round dome shape of Rikoriko is clearly seen here. To the right, in the background is a little extension of the dome. f012109: looking out from Rikoriko Cave, a launch is dwarfed by the cave's huge entrance, which allows yachts to pass. Behind the boat one can see Serpent rock, which from this angle indeed looks like a sea serpent (not visible). f012104: the sides of the cave are artfully painted by dripstone formations and algae of various colours. f043124: the western side of the entrance is richly covered in sponges. f030603: the eastern side of the entrance is rather barren and forms an overhang. There is a small surging cave here. f032601: inside the cave one finds dense covers of sponges, some of which belong to the deep sea. f041732: a fallen pohutukawa tree now provides a substrate for stalked kelp, sponges and an adventurous grey moray eel. Kahawai Point is difficult to reach because boats cannot anchor nearby. But for those who do not mind to swim with their full gear on, it offers a rewarding dive. The point juts out in the current which can run quite fast here. Fortunately there are enough points to hold on to and to pull oneself back out of the current. 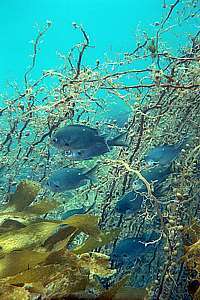 Remember, where one finds currents, schooling fish are plentiful and so are the gorgonean trees and other cliff dwellers. f022932: near Kahawai Point one finds many walls with gorgonean fans. 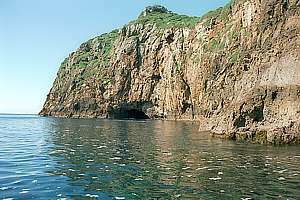 Seal Rock is also called Hundred Foot Pinnacle for the 100FT dives done there as part of BSAC dive certification. Since PADI came in vogue, this is no longer done. Why it is called Seal Rock is not clear, because the rock submerges fully at high tide. One can anchor a boat nearby over 30m depth on rocky bottom. 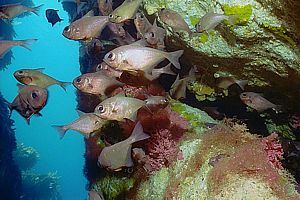 The dive usually consist of doing a deep tour around the rock and spending copious amounts of decompression time in the shallows. In the deep one can encounter giant boarfish and yellow-banded perch. 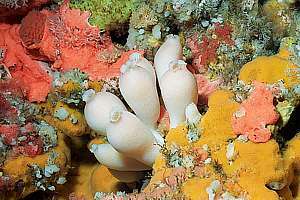 The vertical walls are richly covered in sponges and other sessile filter feeders, and towards the wavy shallows there are dense beds of jewel anemones. 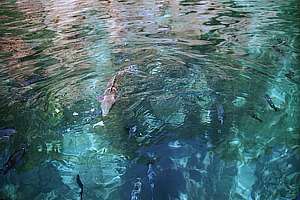 In the shallows one also finds the usual mix of weed-loving fish like marblefish, kelpfish and butterfish. 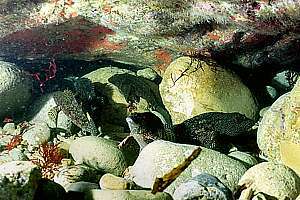 Note that because the rock descends to such depths, it acts like a little oasis for quite a number of shallow living fish species. 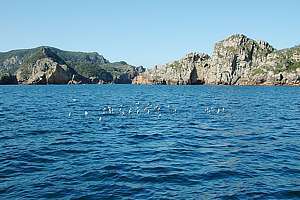 Bird Rock and Seal Rock are located in Bartle's Bay, named after Sandy Bartle, a bird scientist. f052508: jewel anemones in high densities are always spectacular. These clusters are clones of single individuals, hence their spitting similarity. On this photo there are three different ones. On a straigh line East from the Urupa Point passage over Seal Rock, lies Demoiselle Point (an underwater pinnacle) (GPS 35º28.05S 174º44.11E). It is a steep pinnacle rising to 11m depth from a ridge and platform at 17m. The platform to the west of it is large enough for safe anchoring at 17m depth. 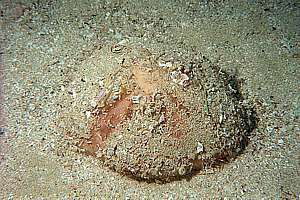 At its deep eastern end, the sea bottom drops away to 60m depth and deeper. 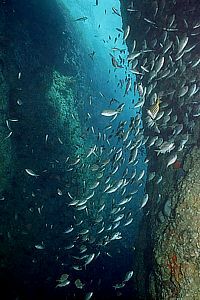 A dive here consists typically of swimming around the pinnacle at a suitable depth, spending the last part of the dive in reasonably shallow water. 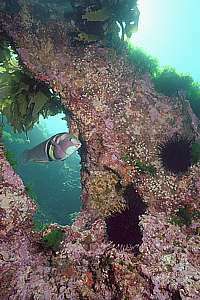 The underwater environment here is typical of an exposed coast with large purple urchins inside their sockets and a kelp forest deeper down to 30m depth. Deeper extends a rather barren area. 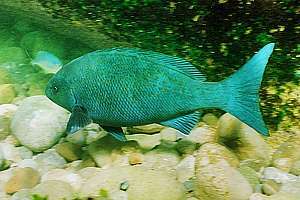 Some schooling fish like pink and blue maomao, and demoiselles are typical. 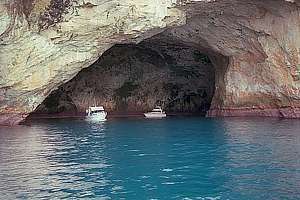 Long Cave, also called Matt's Crack (after veteran diver Matt Conmee) is as its name suggests, long - very long. 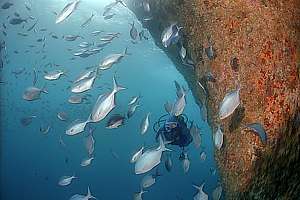 It can be dived only in rare occasions with very calm weather and no swell, because the slightest swell is amplified in this narrow crack that runs across the direction of the swell. One could snorkel all the way to the end, but a good light is needed because it becomes completely dark. The cave begins at a small opening of no higher than 5m, and is easily overlooked or dismissed as a minor feature. In fact, already outside this opening, the crack begins over a shallow ledge. Long Cave is like Barren Arch frequently scraped clean of life by the many boulders that become water-borne projectiles during storms. The water inside the cave does not exchange readily with the outside sea, reason why life peters out quite quickly. 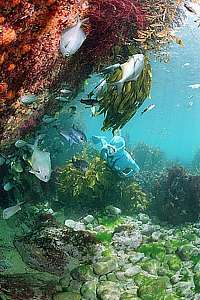 Yet schooling young fish seek refuge there from predators that hunt by eyesight, such as gannet, shag and kingfish. And as one goes deeper, one finds different species seeking different spots inside the long cave. f052713: looking back towards the entrance, Long Cave exaggerates its length by being quite narrow with sheer walls. In the foreground a swarm of young demoiselles. f052720: as the light diminishes, the crack makes a slight s-bend, which yields this pear-shaped blue halo. f224624: the entrance to Long Cave is not spectacular - too small to put a small boat in and its height above water is only a few metres. Finding it could be a problem. f052718: on the barren walls of Long Cave, only some carpet sponges can recover fast enough after being ground away during storms. 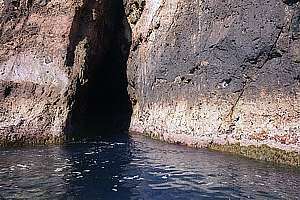 Mine Shaft Cave is a smallish sea cave with a similarly small underwater extent. It is very exposed to NE storms and has therefore no fragile life forms. 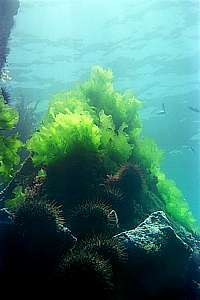 Both Arid Point and Mine Shaft Cave are monotonous expanses of kelps. f224626: Mine Shaft Cave, seen from Long Cave, which is just out of the frame on right. Fred's Pinnacle is a wide saddle between two pinnacles (5 and 13m deep)(35º28.88S 174º44.89E), and part of an ancient ridge extending out from the island. 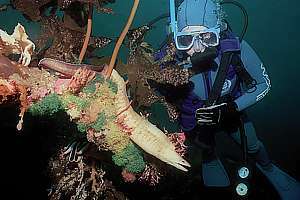 One can anchor safely on the sturdy strap kelp over the saddle of 15m depth. The dive begins uneventful amongst weed loving fishes, but soon the schools of fish come nosing around. 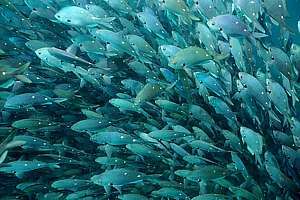 They are all there in huge numbers: demoiselles, blue maomao, trevally, sweep, pink maomao and at the edge of visibility often also baracouta. One soon discovers that Fred's Pinnacle never ends as it descends ever steeper eastward into undivable depths. Flooded by a moderate current, diving is safe apart from maximum depth, but if one does not make it back to the anchor line, which is highly likely in this terrain, one will be making a decompression stop in mid water, being a playball of where currents may take you. As a precaution, begin your underwater navigation as soon as you leave the anchor chain, and often look back to where you came from. Avoid this place in case the currents run strong. f216532: Fred's Pinnacle is found by going NE from this large cave on the main Aorangi island. Note that Mineshaft Cave is just around the corner of Arid Point on the far right. The peak is Tatua Peak, where a Maori village (pa) once was. This photo was taken from Fred's Pinnacle. f049004: Fred's Pinnacle is considered such 'prime real estate' by the underwater world, that the old fish densities we used to know, can still be found there today - a remnant of what once was.